Equity futures were higher overnight with still more rumors, dreams, and jawboning in Europe about creating another $270 billion from thin air and tossing it at the bankers. The headline Employment numbers for November came in with Private Payrolls supposedly creating 120,000 jobs (didn’t really happen), and the headline rate falling from 9.0% all the way to a Presidential touting prior to his re-election 8.6% (definitely didn’t really happen). And thus what we have is a white washed snow jobs report, and the dollar is lower, bonds are flat, oil is higher, gold & silver are higher, and food commodities are flat this morning as the real numbers of unemployed continue to pile up at the food banks. It’s getting ridiculous how large the separation between these economic reports and reality is. It requires a huge amount of work time just to unspin them, and I’m an expert at doing so, just imagine how little effort the majority put into understanding these numbers. It’s subversive and perverse, it’s a part of the cover-up to maintain power and control by those who possess it. They possess that power and control because they unconstitutionally (illegally) were given the power to create money. 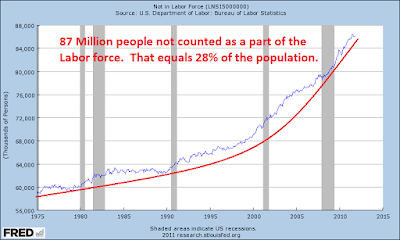 In a nutshell, the only reason the rate fell to 8.6% was because the BLS lowered the Participation Rate by more than 200,000 people, while those "not in the Labor Force" rose by a whopping 576,000! This has the effect of saying those people just aren’t interested in working, and therefore they are no longer counted as unemployed! More on this later, charts included, ugh. The November jobs report overall came in with improvement, though there were mixed results. The unemployment rate unexpectedly dropped sharply. Payroll jobs in November advanced a relatively strong 120,000 after gaining a revised 100,000 in October (originally 80,000) and increased a revised 210,000 in September (previously 158,000). Analysts forecast a 131,000 boost in overall payrolls. 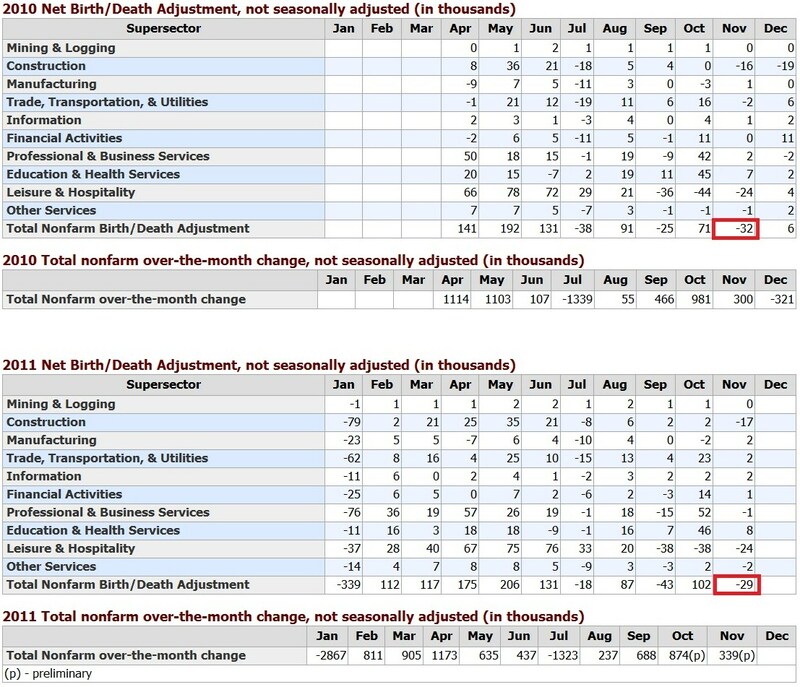 Revisions for September and October were up net 70,000. Once again, private payrolls gained more than overall. Private nonfarm payrolls gained 140,000, following a 117,000 increase in October and 220,000 rise in September. The November boost fell short of market expectations for a 150,000 increase. In the private sector, goods-producing jobs slipped 6,000 after a 4,000 decrease in October and 36,000 boost in September. Construction jobs fell 12,000 in October after decreasing 15,000 the month before. Manufacturing employment edged up 2,000 after a 6,000 rise in October. Mining increased 2,000, following a 6,000 rise the prior month. Private service-providing jobs advanced 146,000 in November, following a 121,000 gain the prior month. The November increase was led by trade & transportation (up 58,000), professional & business services (up 33,000), leisure & hospitality (up 22,000), health care (up 12,000). The temp help subcomponent of professional & business services rose 22,000 after a 16,000 gain. The public sector continued to decline as government employment decreased 20,000, following a 17,000 drop in October. Wage growth has been volatile recently as average hourly earnings in November slipped 0.1 percent, following an upwardly revised 0.3 percent gain the month before. 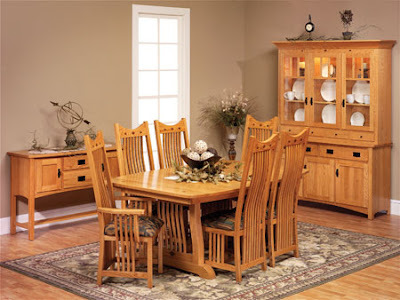 Analysts predicted a 0.2 percent increase for November. On average, wage growth has been growing but at an anemic pace. Given the upward revision to October, the November dip should not been so disconcerting. Still, the uptrend is modest. The average workweek for all workers in November was unchanged at 34.3 hours, matching the market median forecast. From the household survey, the unemployment rate unexpectedly dropped to 8.6 percent from 9.0 percent in October. The consensus forecast called for 9.0 percent. 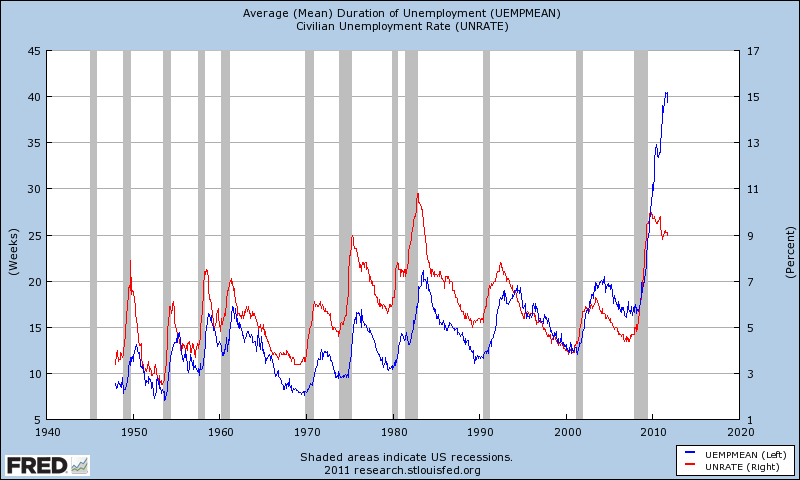 The rate decline reflected a 594,000 fall in the number of unemployed and a 278,000 increase in household employment. 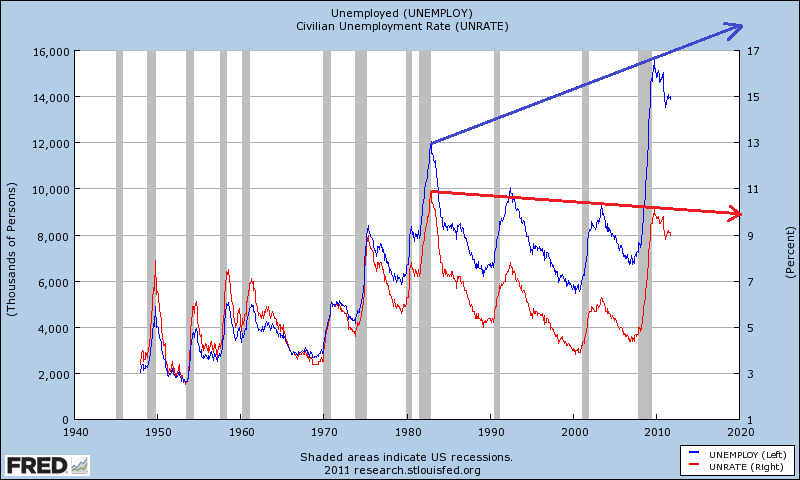 Basically, the unemployment rate fell largely due to a decline in the participation rate although household employment growth recently continues to exceed payroll jobs growth by a notable degree. Overall, the latest employment report is favorable for the recovery continuing to gain traction. On the news, equity futures edged down as expectations were slightly stronger for payroll data and the unemployment rate dip was discounted. 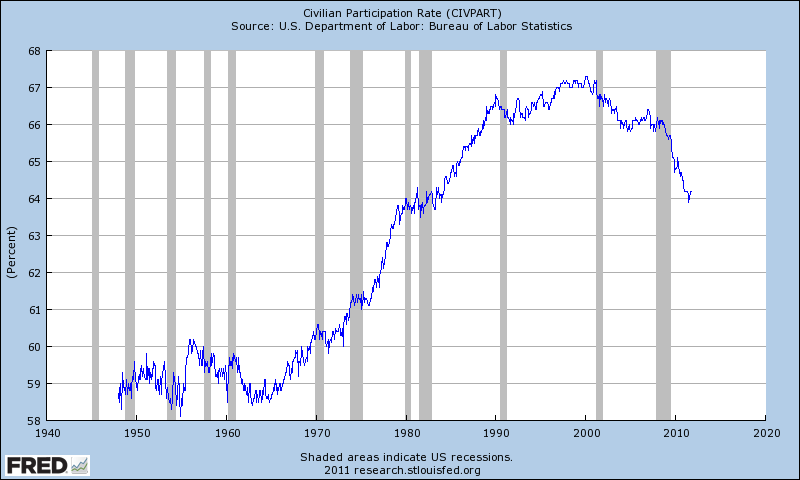 “…the unemployment rate fell largely due to a decline in the participation rate.” That is the key line they buried in the middle, it is the entire reason for the drop. 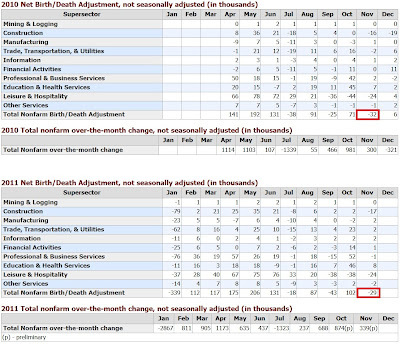 Effective with the release of The Employment Situation for January 2012, scheduled for February 3, 2012, population controls that reflect the results of Census 2010 will be used in the monthly household survey estimation process. Historical data will not be revised to incorporate the new controls; consequently, household survey data for January 2012 will not be directly comparable with that for December 2011 or earlier periods. 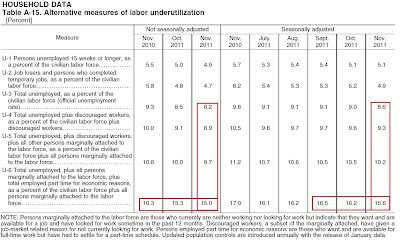 A table showing the effects of the new controls on the major labor force series will be included in the January 2012 release. In other words, they are once again changing the way they report data and once again comparisons to the past will be meaningless. In other words, they are going to manipulate the data some more. Nice of them to warn us. 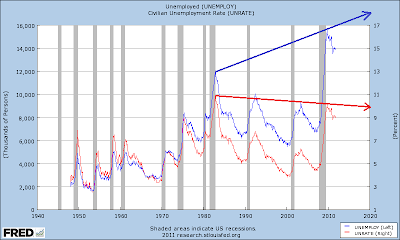 But the truth is the data is so far from comparable already it is nothing but a sick joke – the difference now being a reported 8.6% unemployment rate versus the reality that is closer to 23%!! Note in the Shadow Stats chart above how John William’s numbers that track how it used to be calculated are on an ascending path, while the current numbers from the BLS are on a descending path! 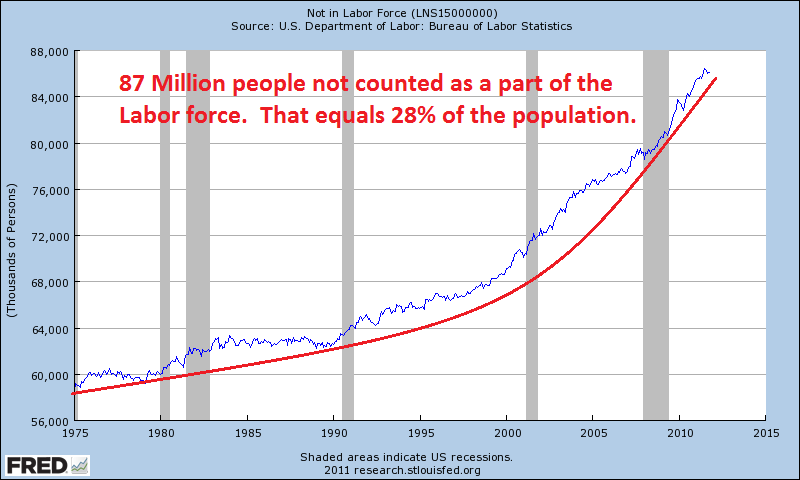 There you have it, right there – the BLS has manipulated the numbers so badly they are simply false, a giant lie. 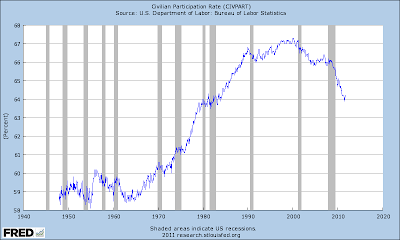 The Alternate Table is also affected by the Participation Rate, still U-6 is running 15.6%, a far cry from the advertised 8.6%! 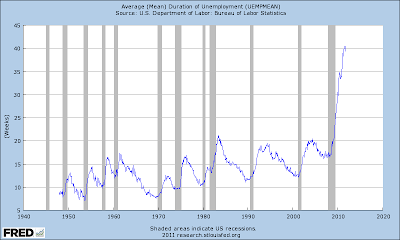 Now, who can tell me what is wrong with the following chart? In blue is the Mean Duration of Unemployment, and in red is the advertised Unemployment Rate. 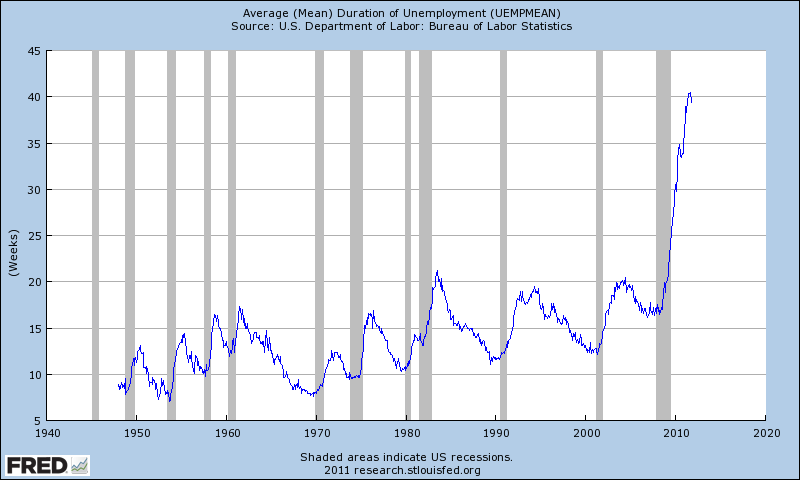 Note what’s been happening since 2010… at no time prior has there ever been a disconnect like that with the rate supposedly falling while at the same time the duration of unemployment is skyrocketing – again, which one is lying? The bottom line for me is that it is clear the data is being manipulated and that the separation between reality and the spin is growing wider. It’s my belief this is all a part of the tendency to hold onto power. Power emanates from the ability to create money – it is that power that gives the ability to write and to rewrite the current rule of law, regardless of whether that law conforms to our Constitution or to any semblance of a proper and natural rule of law. Manipulation of the data at this point aims to ensure the status quo. Note the headline on CNN immediately following the release of this report: Jobless Rate Plummets!